I’m only six years old, but even I know that poverty is a terrible thing. I see the other kids at school whose clothes have holes in them, or who can’t afford new toys like the ones I have, or who are having serious family issues unlike anything I’ve experienced. And yes, I’ve noticed that they tend to do worse in school than my friends from higher-income families. Out in the big wide world of education policy, you won’t find anyone credible who will argue that poverty does not have a significant impact on academic achievement. For proof, all you need to do is take a look at the familiar income-related achievement gaps seen in last year’s PARCC scores, or the data illustrating these gaps on the most recent NAEP exam. But why? Do we have an education problem, or a poverty problem? Are we talking about the chicken, or the egg? Most of you know that I absolutely loathe the common argument that we have to fix poverty before we can fix achievement gaps. I fully reject the argument that low-income kids are liabilities who should be simply shuffled through a school system that callously shrugs its shoulders and says, in essence, “there’s nothing we can do with these kids.” And I think there’s plenty of reason to believe that effective schools—private, charter, and traditional—can help low-income kids defy the odds and build successful lives that break the malicious cycle of poverty rather than perpetuate it. With the release of a new Education Next study on poverty and education in America, we have yet another piece of evidence contradicting the idea that the United States is experiencing a poverty crisis rather than an education crisis. The study, written by Michael Petrilli and Brandon White of the Fordham Institute, takes a look at whether we ought to be blaming poverty—and not our education system—for our nation’s mediocre academic performance. To do this, the authors of study establish a three-pronged test. At least two prongs need to be true, they argue, to evince the notion that we silly education reformers should be spending less time talking about changes to the education system and more time trying to cure poverty separately. Poverty is demonstrably related to student learning. Not surprisingly, the study goes on to find that the first prong of the test is definitely satisfied by available evidence. That fits neatly with the income achievement gap information I mentioned above, and is not exactly an earth-shattering discovery. The findings on the other two prongs, however, are more interesting. The second prong deals with whether or not America’s low-income students perform worse than poor students elsewhere. To answer this question, the authors turn to the PISA test, which measures the academic achievement of 15-year-olds in countries who are members of the Organization for Economic Cooperation and Development (OECD)—a generally accepted proxy for being part of the developed world. 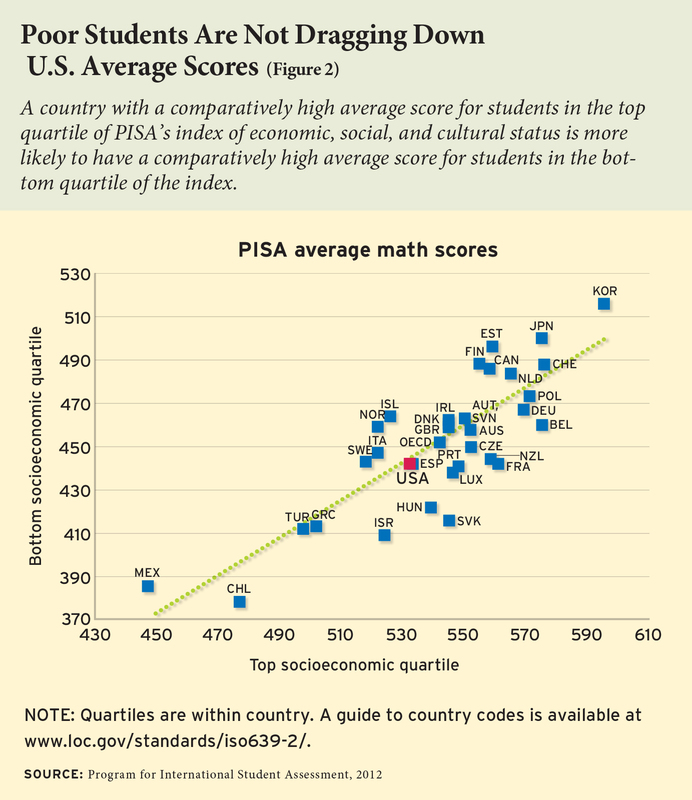 Using PISA’s index of “status,” which includes family wealth and parental education levels, the authors examine the proposition that America is disproportionately failing its poor students compared to other developed nations. Their findings? The third and final prong deals with what I like to call The Finland Theory. You’re all familiar with this one, I’m sure. Basically, someone argues that Finland—or some other Scandinavian nation—is an incredibly high-performing nation academically, and that achievement gaps have been largely closed in said nation because strong “safety nets” –which many of us might call “socialism”—exist to level the playing field outside of school. In other words, folks often argue, Finland and other Scandinavian nations fixed education by “fixing” poverty. There are two issues with this argument. First of all, Finland isn’t really all that high performing, coming in twelfth among OECD countries in math on the 2012 PISA test—behind countries like Estonia, Liechtenstein, and Singapore. That’s admittedly better than America’s meager 27th place, but it isn’t exactly jump-out-of-your-seat impressive. 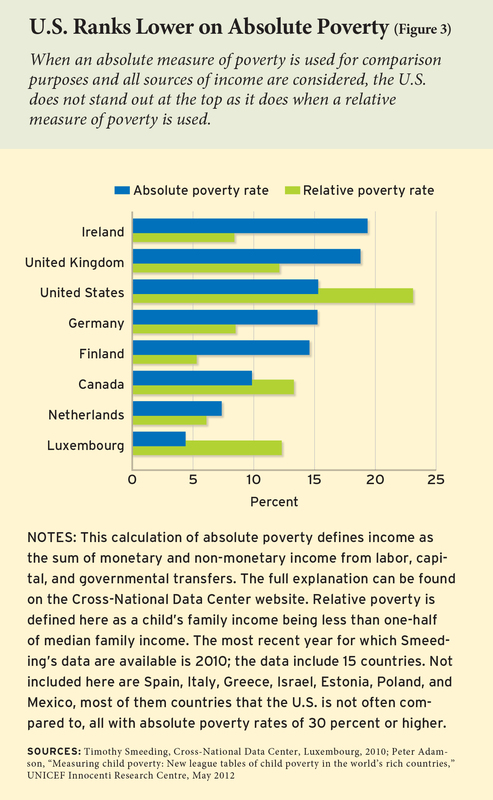 Second, Finland’s population isn’t much better off than ours when it comes to absolute poverty. … poverty can’t explain away America’s lackluster academic performance. That excuse, however soothing it may be to educators, politicians, and social critics, turns out to be a crutch that’s unfounded in evidence. We need to stop using it and start getting serious about improving the achievement of all the nation’s students. I couldn’t have said it better myself. See you next time!